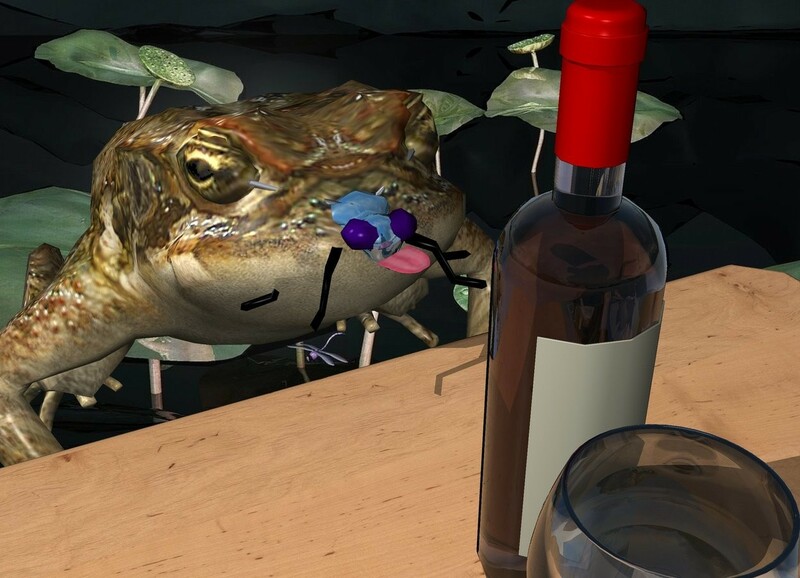 Input text: a table.a 1st 20 inch tall frog is in front of the table.the 1st frog is facing the table.a 2nd 35 inch tall frog is behind the table.a frog backdrop.a 8 inch tall shiny petrol blue fly is -11.5 inches above and -13.23 inches in front of the 2nd frog. it leans 12 degrees to the back. a 25 inch tall wine bottle is on the table.a 15 inch tall wine glass is 4 inch in front of the wine bottle.the wine glass is -12 inch right of the wine bottle. a 4 inch long and .2 inch tall tongue is -5.4 inch above and -1.3 inch in front of the fly. it leans 25 degrees to the northeast.